Andrew Johnson & his sons Fred, David and Frank started the business in 1906 with a small, portable mill. They purchased timber and wood lots in the area between Glens Falls and Saratoga, New York and logged them to supply the mill. 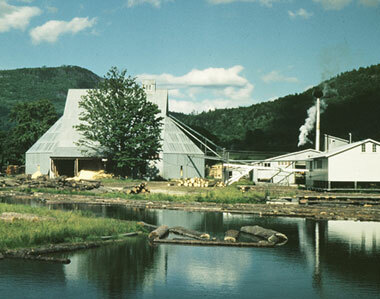 In 1914 the mill was moved to Pike, N. H. and stayed there for four years. Both Andrew and his son David died while the mill was at Pike. Fred and Frank Johnson next moved the mill to Lake Dunmore, VT in 1918. The mill was at the north end of the lake on a small pond north of the road. In 1926 Fred and Frank Johnson split up, with Fred taking the mill and Frank taking the property, including some lake frontage. Frank had started a car dealership in Middlebury and wanted to pursue that full-time. At this point Fred moved the mill to Lincoln, Vermont, near South Lincoln with the logging camp 4 miles up river near Big Basin. The mill consisted of a circular mill, hot pond, long timber mill, clapboard mill, planer mill, retail sheds and camps for key employees. During the Great Depression the mill experienced very difficult times. 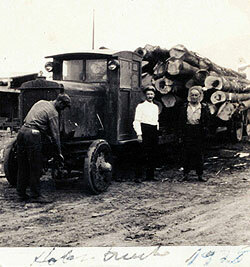 By the middle of the 1930's the majority of the logs for mill production were being trucked to Lincoln, so Fred decided to move the mill again. Fred settled on the Burpee Farm, south of Bristol, since it was flat for easy movement around the site and had a stream, which would allow the construction of a millpond for log storage. 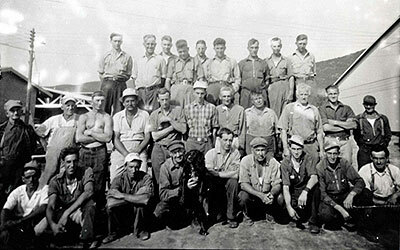 Henry LaBelle of Hinesburg and his crew constructed the original buildings in 1937 and 1938. The pond was dug with horses and scrapers. Bark and chips are burned in a Chiptec gasification system to heat our dry kilns in an environmentally-friendly manner. Upstairs view of the sorting bays of the dry lumber sorter. Professional foresters have been employed to manage our woodlands since 1944, marking the transition to professional management for long-term ownership of the land and sustainable growth. The management of company lands now receives high ratings from other foresters for the quality of the forestry work as well as the health of the timber. The lands provide perhaps 15% of the annual sawn volume. The first dry kilns were constructed in the 1950's and tractor-trailers, forklifts, automatic carriage, etc. were added about that time as well. A band resaw was added in the 60's and then a band headrig (replacing a circular headrig) was added in the 1970's. A twin-saw circular scrag mill was added in the late 70's and a band resaw was added to the scrag mill in the 80's. Construction of concrete block dry kilns was begun in the 60's. 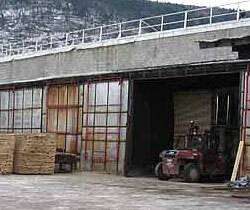 Green and dry lumber sorters were built in the late 1980's and early 1990's with computer control systems. In the 1980's the active management moved to a group consisting of Andrew Johnson and six members of the next generation: sons Phillip and his wife Ann, sons David and Kenneth, daughter Carolyn and her husband, William Sayre. A computer-controlled carriage with linear positioner cylinders was added in 1993 and a photocell curtain scanner by Silvatech was added in the late 90's. 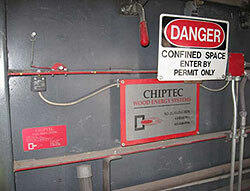 In 2000 a Chiptec gasification system was installed at the dry kilns, replacing a dutch oven style combustion system. The Chiptec system greatly improved our combustion efficiency, providing increased steam generation capability for improved heating and conditioning in the kilns as well. 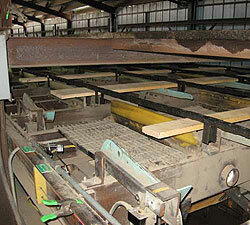 A new controller by Autolog was installed on the green sorter in 2001, improving our sorting flexibility. 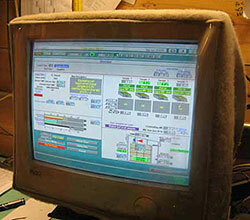 Computerized kiln controls by SII were added in the dry kilns over 2003 and 2004. The SII controllers increased our control of the drying process. The Silvatech controller on the dry sorter was upgraded in 2004 and in 2007. In late 2003 active management passed to Ann Johnson, David Johnson and Kenneth Johnson. In the second half of 2005 and early 2006 we installed a 35" capacity Nicholson A6 ring debarker with an MDI whole-log metal detector to debark logs for both mills. This system improves the debarking quality, wasting little of the valuable fiber of the log, and helps to minimize bruising. The improved debarking increases the quality of the lumber produced while ensuring that waste is minimized; the metal detector keeps tramp metal from the saws. For the last 4 years we have sold chips to schools in support of the growing trend toward biomass heating systems. In 2008 we moved into the firewood business to improve our competitive position in the timber markets.